B’nai Havurah has an active Tikkun Olam (repairing the world) Committee which works to help alleviate hunger, homelessness, disease, ignorance, abuse, and oppression among all people. In addition, the committee works to preserve the health of the global ecosystem upon which all life depends. Tikkun Olam is prepared to take action, both individually and as a community, that is ethically and socially responsible. The Tikkun Olam Committee welcomes grant proposals for social action projects that will be initiated by a congregation member or agency. 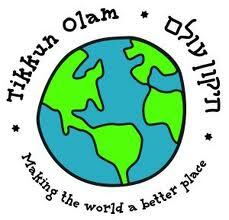 Tikkun Olam grants go to projects that act on the Tikkun Olam obligation to repair the world. We encourage submission of proposals that address problems such as child poverty, domestic violence, homelessness and saving the earth. Previous projects funded through Tikkun Olam have been sponsored by groups such as Women4Women Knitting4Peace, Place Bridge Academy, Kavod on the Road, Jewish Family Service, the Kenya-based Sharing Hope for Communities, the Habitat for Humanity Interfaith Alliance, Family Tree and Ekar Farm. Please download forms here or contact the office at 303-388-4441 and we will mail or email you an application. Grant proposals are accepted any time. Use the form below to apply for a grant, or download and print out the form provided. Purpose: The purpose of the Program is to fund Tikkun Olam activities sponsored by or involving B’nai Havurah members. The funds are made possible by $9/year (half shekel) contributions from B'nai Havurah members and young adults who are bar/bat mitzvahs, as well as other contributions. The Tikkun Olam Committee has the responsibility of allocating monies to activities that contribute to the "healing of the world" and are consistent with the Mission and Values Statements of B'nai Havurah (see Appendix 1). The Tikkun Olam Committee awards these monies through grants approved by its Grants Subcommittee. Form: Requests for funding must come from B’nai Havurah members and provide information using the attached application form. Requests should be brief, readable, and informative. Requests by e-mail are encouraged and should be sent to tikkunolam@bnaihavurah.org. Deadline for Submission: The Tikkun Olam Grants Sub-committee accepts project proposals for Tikkun Olam grant funds at any time. Every effort will be made by the Subcommittee to decide whether to fund grant requests within two weeks of receiving a proposal. Applications not receiving funds may be revised and resubmitted. Amount to be Allocated: Requests for Tikkun Olam Grants are limited to no more than $500. Criteria: Applications will be evaluated for inclusivity, cost effectiveness, level of benefit to - and participation by - the B’nai Havurah community, the Jewish community and the community as a whole. Grants Subcommittee Decisions are Final. The Subcommittee will review all requests and make decisions based on the above criteria. Its decisions will be final. Reasons for denial will be provided to all whose grant requests are not funded. Deadline for Use of Funds Awarded: Funds granted by the Grants Subcommittee must be used no later than one year from the date they are provided to the grantee. You may also complete the online form below. Based on the Grant Form Instructions and General Information, please describe how this grant will answer the following questions. I. What is the primary goal of the proposed project? II. How will this goal be accomplished? Include when and where the proposed project will occur and who or what will be impacted by it. III. How will the funds be used and managed? Who will be responsible for managing the funds? Will additional funds from other sources be required? If so, how and when will these additional funds be obtained? IV. How will B’nai Havurah benefit? These benefits should also be documented in the required report at the completion of the project. VI. How much funding are you requesting for this project? Please provide a budget detailing how you plan to expend the monies. VII. Please describe the opportunities for interested members of B’nai Havurah to participate in or contribute to this project. How will you inform B’nai Havurah members about these opportunities? VIII. Write or attach a brief description of any organization(s) for which this funding request is made. IX. Is there any additional information you would like us to have? By submitting this application, the B’nai Havurah member(s) listed on the first box of this form agrees to ensure that written and/or oral interim and final reports describing project achievements will be submitted. The Tikkun Olam Committee will determine reporting dates.